…Or learn to respect my culinary personal space. 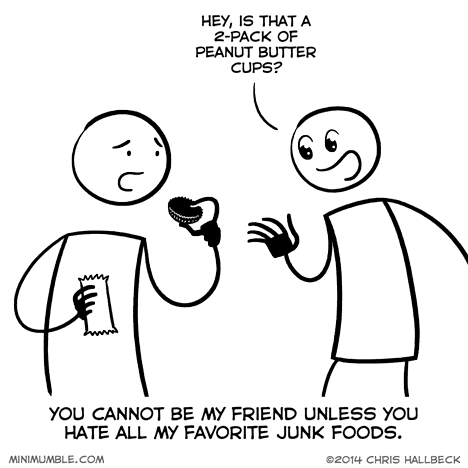 Well, I hate peanut butter, but we might still get into a Kat fight. You should ask your mother if you can sleep over for my birthday! Oh yeah and funny cartoon btw. Chris I love peanut butter cups but I know how it feels for people to steal one when you bought both for yourself so I would never think about stealing from you can we still be friends? Among my favorite junk foods is real licorice whips, y’know, the black ones. Always safe. Every Easter time, I ended up with the licorice jelly beans passed to me from others. Good for me. Stay away from my peanut butter cups, and nobody gets hurt. I only kill for licorice, O-henry bars, and Cheetos. Stealing any other candy is merely punished by maiming. I’m allergic to it all… doesn’t mean I don’t cheat every once in a blue moon, but never with a gluten product. So those are safe. LET’S BE FRIENDS. *opens mail* Restraining order? How odd.